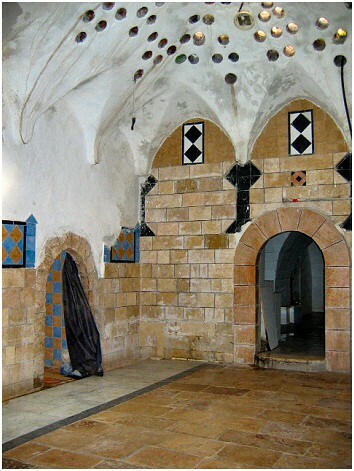 An ancient Turkish Bath in the Old City of Nablus, dating from the thirteenth century, has Sunday afternoons set aside for women. Our new lives as Ecumentical Accompaniers with the World Council of Churches, are challenging, and Church on Sunday, meeting up with the other teams from the North West Bank, is both a joy and comfort. I can now identify with the importance of Sundays in the lives of pioneers who lived in homesteads separated by long distances, where life was hard and lonely. Gathering together on a Sunday provided spiritual, social and emotional support as one forged a new life. I look forward to these Sunday gatherings where we let our hair down, share our adventures, our trials and soothe each other. After church in one of the four Christian churches, – Anglican, Roman Catholic, Greek Orthodox and Armenian, we have lunch at newly discovered restaurants and then….the Turkish Baths. 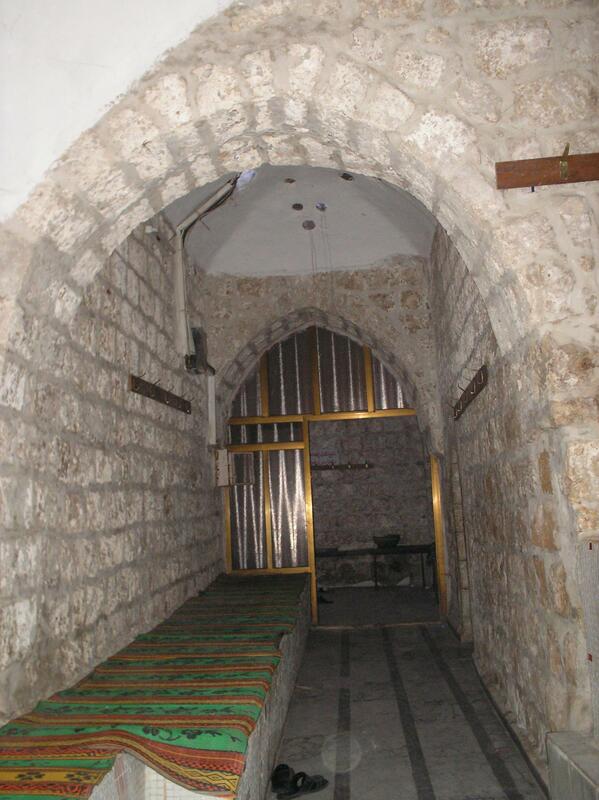 Nablus is home to a surviving ancient Bath deep in the Souk in the winding passage ways of the old city. With excitement and some trepidation, we entered the narrow corridor leading to the entrance. A magnificent door opens onto a small foyer which leads into a lounge area., with traditional patterned mattresses lining the walls. Here woman are lying about chatting, drinking tea, eating snacks, receiving facials, henna tattoos in strategic areas of their bodies, henna hair. Children , under 8 it seems, wander about amusing themselves as their mothers, aunts and grandmothers, have a pleasurable day together. A fountain takes pride of place in the center of the room. Children sometimes paddle in it. We decided that we would go for the full treatment which included the hot rocks, steam room, sauna, skin rubbing, and massage for approximately $45.00. Towels, olive oil soap, loofah and wooden clogs were standard issue and so we embarked on our adventure. We were shown to a large domed room with ancient stone floors bordered by smaller rooms with a stone basin. We were to sit on a small stone block, fill the basin with water and scrub ourselves with the soap and loofah. Then the sauna! Ten minutes on ancient benches was enough A cold shower ( saving us from complete collapse) ,then the steam room ( I have an idea of how lobsters are cooked) and a … cold shower. The hot stones beckoned and lying down and I am captivated by the colored circular patterned openings in the ceiling Women were lying, rolling, preening, exercising, in complete comfort. We were also losing whatever inhibitions we entered with. Then, skin rubbing! A screened off room was the destination for a steady stream of women. I was told to take off my rather extensive bathing suit. While her back was turned I did as I was told and was taken aback when she turned to me and quickly turned away. She explained that according to her religion, she could not see all of my body, and so …red faced…for yet another reason, I pulled my bathing suit back on, covering the offending part. A camel-hair loofah was used to scrub my skin To say I was shocked by what came off is an understatement. The massage! Olive oil infused with aromatic herbs was slathered unto skin thirsty for rejuvenation. The knots and spasms were vigorously kneaded out until I became a rag doll, muscles released from the tension of the week. Back to the hot stones to allow time for the oil to seep in. I lay there in complete relaxation as all the cares of the world faded into nothingness. The play of light through the glass in the ceiling gave it a dreaminess that I didn’t want to let go. A shower, change, and new energy in a languid sort of way. We entered the lounge and joined the women. As we were rehydrating with tea, we noticed the women being painted with henna. We looked at each other….Why not!!! We chose beautiful floral patterns that trailed from the tip of our index finger along the hand and up the forearm. Oh Pat, that sounds like an absolutely delightful way to spend an afternoon. I’m glad you experienced that. Sounds like a luxurious and very special day on many levels! It is an experience I hope to have at some point in my journey! You’ll have to choose a placement visit in the area!!! Pat, it was such a delight just to READ about your experience! Thanks for sharing in such a vivid way! My relaxation today came as I trouted my way from Bareneed to town… then fried the trout… and savour their flavor – oh, the bounty we’re given! (Sorry vegetarians!) Take care! What a lovely experience, Patricia! Glad you could enjoy this. Stay well, we are thinking of you. Patricia, well here’s another reason to return to Palestine. I did not experience this. Hmmm, were there other things happening when I visited you? I hope Marietta reads this. Thanks for the great photos and for all your work in Jayyous and Yanoun. See you soon.